Dr. Eduard Schenuit is metals industry manager for Zwick/Roell, with U.S. offices operating as Zwick USA, Kennesaw, GA; tel. 770/420-6555, www.zwickusa.com. Rising demand for materials that offer increased strength has led to the rapid adoption of high-tensile- and ultra-high-tensile-strength steels. The reduction in ductility among novel advanced high-strength steels (AHSS), however, is setting new challenges for forming technology and process control. These challenges have translated into increased requirements for testing and greater stringency in material characterization of AHSS. Crucial to these efforts are testing machines, charged with assisting in the characterization of new alloys and new metalforming technologies, as well as in eventual part production. Sheetmetal-testing machines, such as this BUP 1000 from Zwick/Roell with an Aramis optical 3D deformation-analysis system installed, are used by automakers and others to assess the formability of advanced high-strength steels. Testing machines perform many functions of vital importance to metalformers, acquiring data to determine how materials will react during various forming operations and building valuable datasets for future reference. This is especially true for deep drawing, frequently used in AHSS automotive applications where a sheetmetal blank is radially drawn into a forming die via a punch such that the depth of the drawn part often exceeds its diameter. The deep-drawability of a material is characterized by the ratio of the blank diameter at the onset of failure to the punch diameter. This ratio, referred to as the limiting drawing ratio (LDR), is correlated to the plastic strain ratio, or r-value, of the material. The r-value is defined as the ratio between true plastic strain in the width direction and true plastic strain in the thickness direction during a uniaxial tensile test. The r-value essentially is a measure of the sheetmetal specimen’s anisotropy, that is, the directional dependence of a physical property within a given material. The degree to which a sheetmetal specimen displays anisotropic behavior influences its deep-drawability. A mechanical testing method employed to characterize the deep-drawability of a material is the cup-drawing test. Here, circular blanks are deep-drawn to the form of cylindrical cups by means of a classical tool geometry consisting of a cylindrical punch, die and blankholder. When determining the formability of newer AHSS grades, particular importance is attached to determining the forming-limit curve (FLC). This occurs in a multistage experiment that generates critical deformations in tests, which then are compared with existing deformations on real components, and subsequently evaluated. Once the FLC has been determined, it is used at the component design stage to help optimize forming, thereby speeding the development process. In addition to use of a sheetmetal-testing machine, these tests—specified in ISO 12004—also require a suitable optical evaluation system to assist metalformers in building the graphical representation of forming behavior along the FLC. Fig. 2—Graphical representation of the microstructure of transformation-induced-plasticity (TRIP) steel. Courtesy of WorldAutoSteel. WorldAutoSteel, the automotive group of the World Steel Association, offers a depiction of key properties that influence formability among various grades of steel (Fig. 1). Within this particular diagram, transformation-induced-plasticity (TRIP) steels display an excellent balance of properties. According to WorldAutoSteel, during deformation the dispersion of hard second phases in soft ferrite creates a high work-hardening rate, which also is observed in dual-phase (DP) steels. 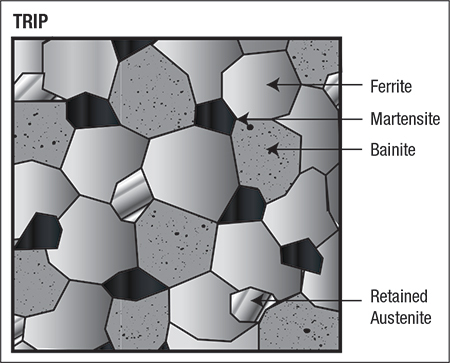 In TRIP steels, however, the retained austenite (a ductile, high-temperature phase of iron) also progressively transforms to martensite (a tough, non-equilibrium phase) with increasing strain, thereby increasing the work-hardening rate at higher strain levels (Fig. 2). This unique characteristic provides increased formability, enabling automotive design engineers to employ TRIP steels in the production of parts with more complex geometry. Fig. 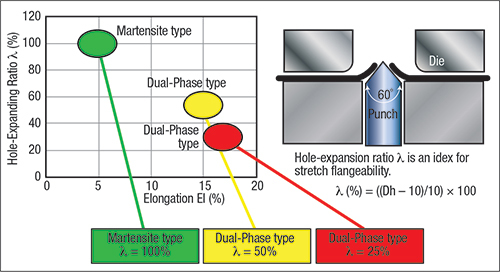 3—Hole-expansion tests commonly are used to assess edge-cracking resistance. Courtesy of WorldAutoSteel. With any of these grades, sheetmetal tests may include the classical Erichsen cupping test (EN ISO 20482), the earing test (EN 1669) and hole-expanding tests (ISO 16630). These tests are seeing increasing use with high-tensile-strength steels. The Erichsen cupping test is a ductility test employed to evaluate the ability of metallic sheets and strips to undergo plastic deformation in stretch forming. 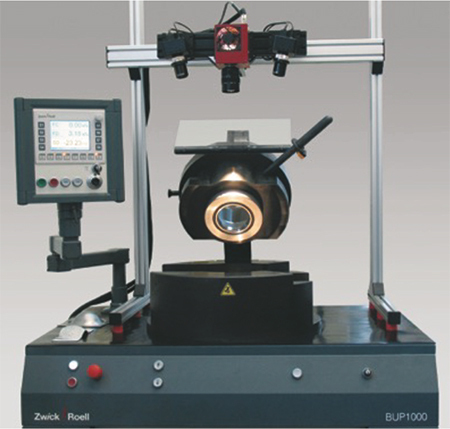 The test consists of forming an indentation by pressing a punch with a spherical end against a test piece clamped between a blankholder and a die until a through-crack appears. The depth of the cup is then measured.